DISCLOSURE: I participated in an Influencer Activation on behalf of Influence Central for Hasbro and Playskool. I received product samples and a party stipend to facilitate my review, as well as a promotional item to thank me for my participation. Know that I only promote products I personally use and stand behind. Please review my disclosure policy here. In case you’re new here, let me tell you one of my 2 year old’s current loves: ELMO. 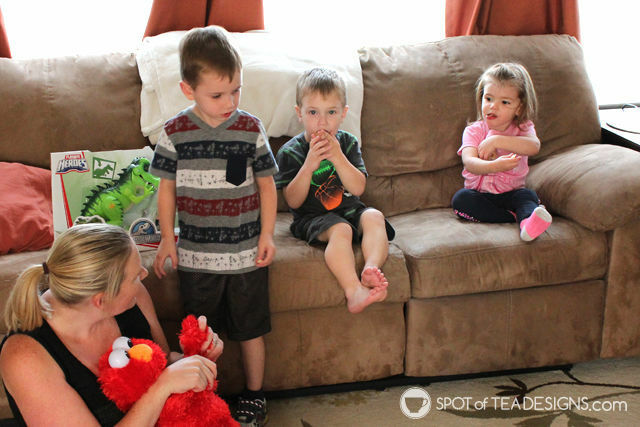 She has a plush Elmo doll that she sleeps with nightly, she wants to watch “Elmo show” every morning while we eat breakfast, she loves to point out any Elmo related item we see when we’re out and she recently enjoyed an Elmo birthday party in July. 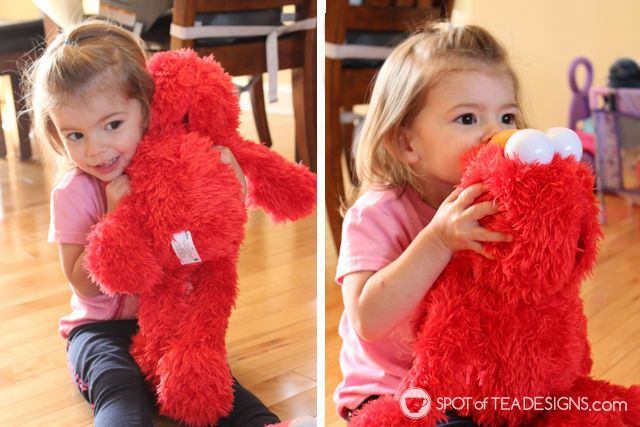 So when asked if we wanted to check out a new Elmo toy, I jumped right on it! Last Friday afternoon I hosted a little get together with some cousins and friends to introduce them to Play All Day Elmo. 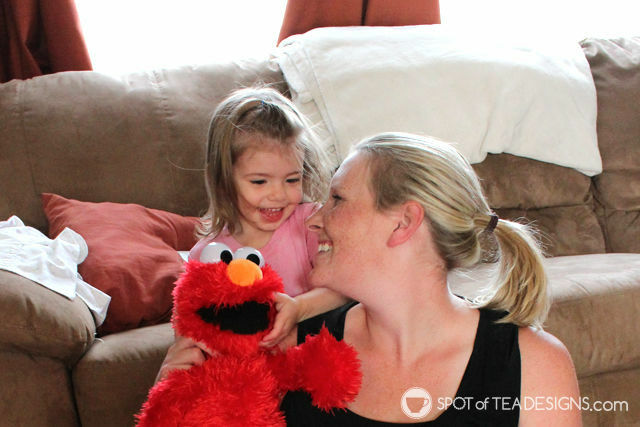 Yes, he’s a LARGE plush Elmo doll with 150+ responses that a child can give life sized hugs. 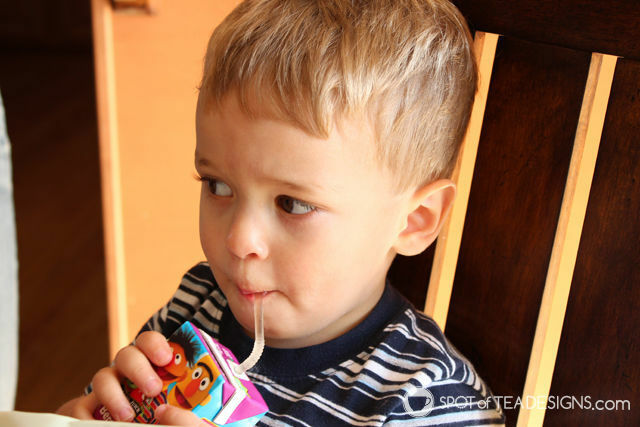 But he also has a playful side with 8 games and activities, hence the playdate! 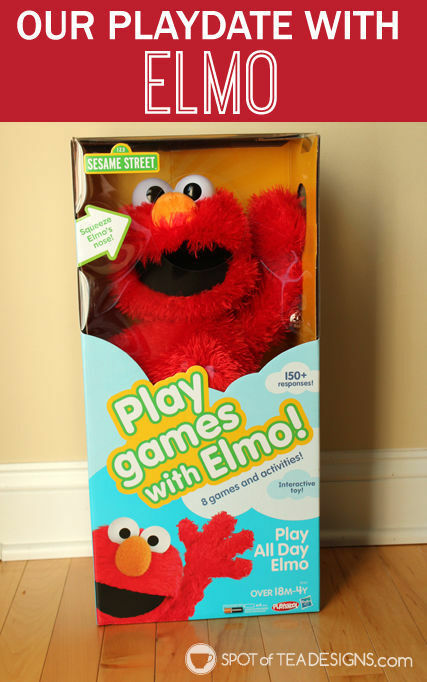 Elmo has two different play modes (toddler and preschool) so he isn’t limited to only younger kids. 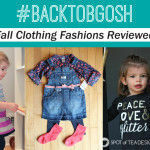 We had a mix of both age groups in our playgroup so we gave both modes a try. 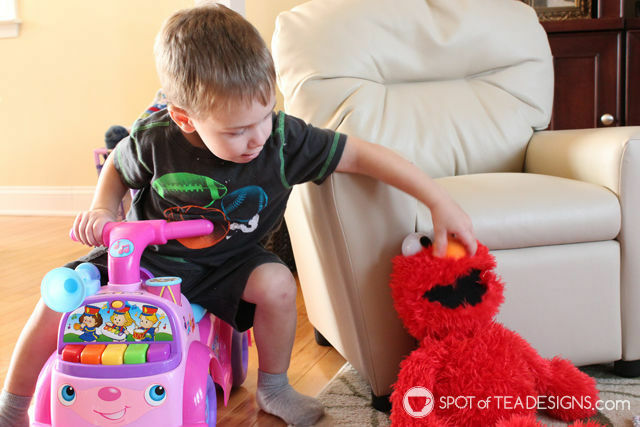 In toddler mode Elmo plays cause-and-effect games where kids can tickle him or squeeze his nose to see how he responds. I didn’t even have to coax them to figure this out. Brielle went right ahead to giving him hugs (which squeezes his tummy and made him laugh) and giving him kisses where he kissed her right back! 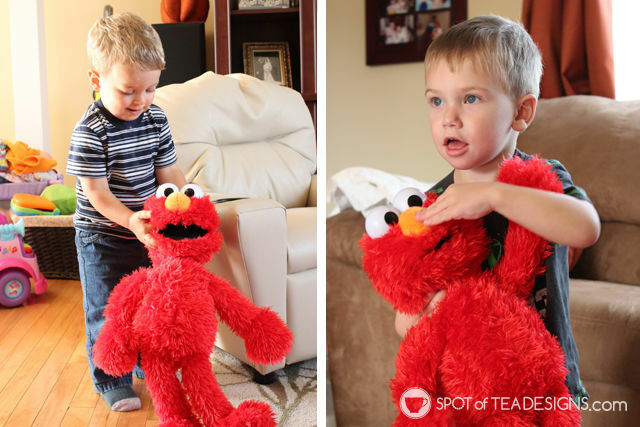 Elmo has built in sensors to help him respond to different activities or positions. Gabriel discovered how Elmo makes a “boing boing boing” sound when you bounce him up and down while Logan enjoyed the different noises he made when you squeeze his nose. He couldn’t get enough of the nose noises and kept coming back for more! In preschool mode he plays actual interactive games with the kids. Elmo takes play to the next level with games (like Elmo says, Color Guessing, What’s Up in the Sky, and Red Light Green Light) and activities (like Pat-a-Cake, Hop and Count, Animal Sounds and Freeze Dance). Here Aunt Mel is helping play Pat-a-Cake with some of our crew. 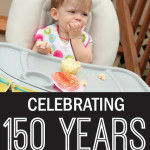 After having some fun with Elmo, we took a break for some snacks. 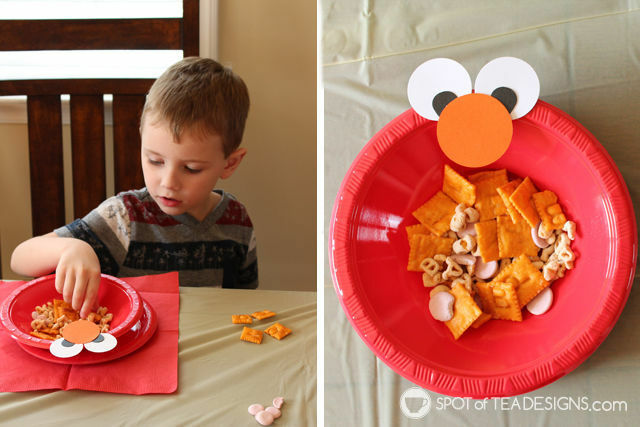 I kept the educational Elmo theme going and provided everyone with some sliced apples, alphabet themed trail mix and Sesame Street juice boxes in my DIY Elmo bowls. I used the same punches I had used for the Elmo invitations I made for her party. 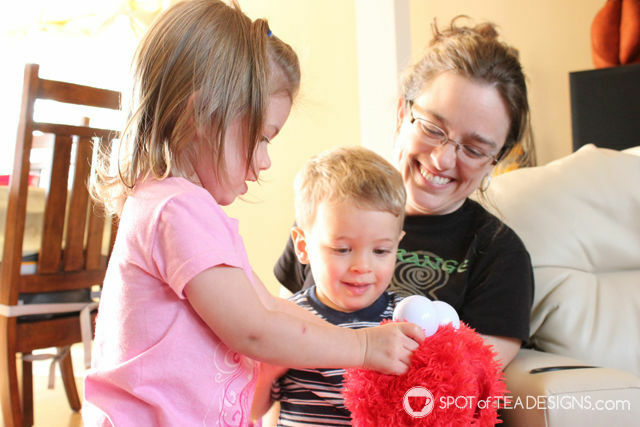 After an exhausting playtime, you can also switch Elmo to “naptime” mode so we had the kids try it out. You can cuddle him and his red fluffy fur and he’ll sing you a lullaby if you squeeze his nose. We didn’t get to explore this mode as these kids were nowhere near napping! A party wouldn’t be complete without goodies to take home, right? 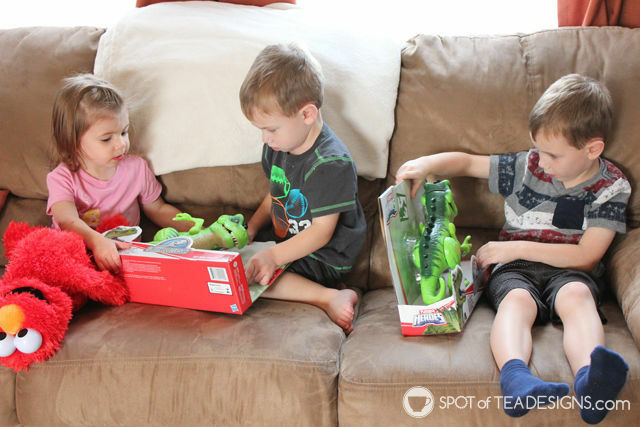 Each child was generously gifted a My Little Pony Musical Celebration Castle (MSRP $29.99) and Jurassic World Tyrannosaurus Rex (MSRP $29.99) to take home and enjoy! With a party mostly full of boys, they were of course all drawn to the oversized dino and the adventurer. It has light up eyes and a big roar! Cousin Brinley wasn’t able to attend our party but we made time another day to introduce her to Elmo and the whimsical world of My Little Pony. 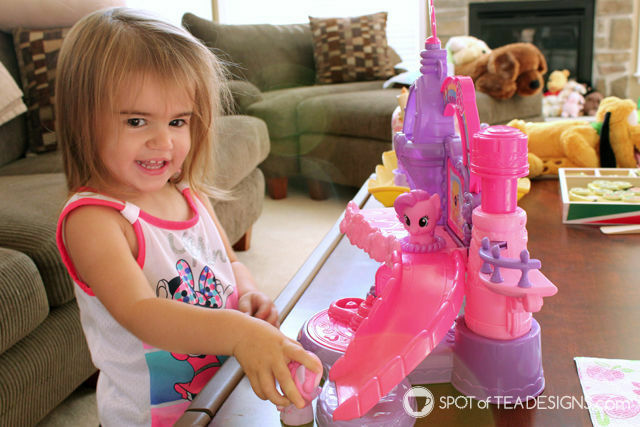 The girl loves “neigh neighs” and anything purple so she got a kick out of this musical castle, loving to take the ponies on a ride down the slide or a spin on the dance floor. 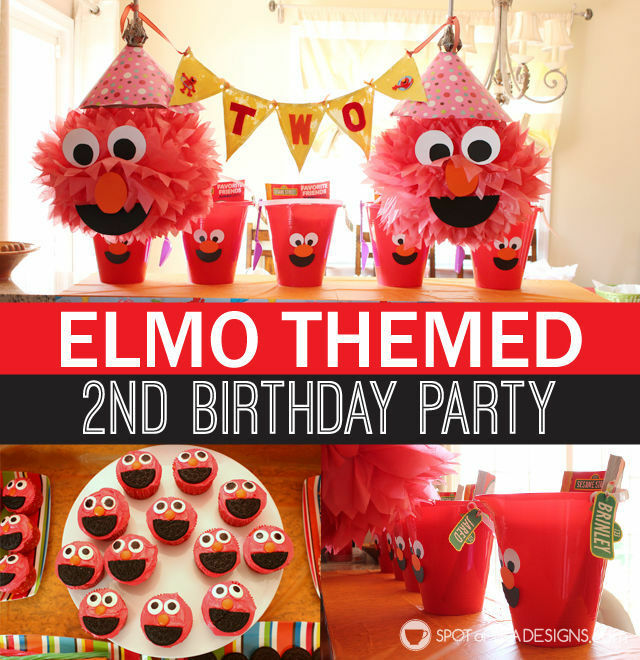 If you’re looking for more Elmo party ideas, make sure to check out my full post showcasing Brielle’s Elmo 2nd birthday party! 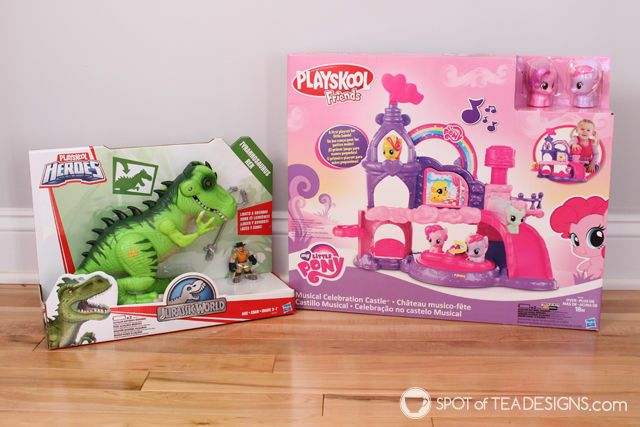 To learn more about Play All Day Elmo, the My Little Pony Musical Celebration Castle or Jurassic Park Tyrannosaurus Rex, visit the Hasbro website, Facebook, Twitter or Instagram page. They’re available at the Hasbro Toy Shop or at most major toy retailers nationwide.